There is no doubt that one of the most desirable elements in any home is the presence of an attractive and functional fireplace. To many, the traditional beauty and value of a masonry fireplace has no substitute. It’s strength, durability and safety record are among the indisputable advantages of an open hearth masonry system. 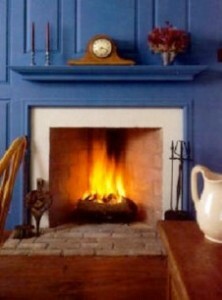 It’s also a fact that a home with a fireplace commands more real estate value than a similar home without a fireplace. The Homer C. Godfrey Co. has supplied the materials for literally thousands of masonry fireplaces in our 80 plus years in business. We have all the necessary expertise and materials required to construct even the most elaborate of hearth, damper and chimney combinations. There are a variety of materials needed to construct a quality fireplace. The following list includes the necessary items and many specialty fireplace products, all available from The Homer C. Godfrey Co. 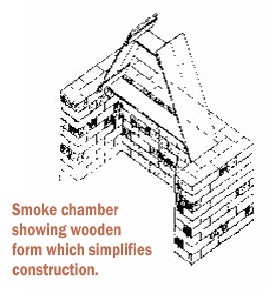 It is of great importance that the smoke chamber, that area above the damper, be properly sized and constructed. It is important that the slope of its two sides be identical and that the chimney flue be started at the top and center of the smoke chamber. A form consisting of two boards and connecting braces helps to maintain the brickwork at the proper slope. The top of the smoke chamber should be sized to match the flue lining to be used. The inside surface of the smoke chamber should be made smooth by troweling with cement. The importance of constructing a chimney flue of proper size, suited to the size of the fireplace opening, cannot be over emphasized. 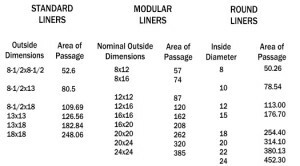 Standard flue lining sizes and free area of passage are shown in the accompanying table. 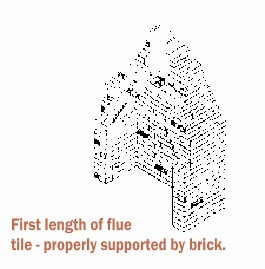 The recommend flue lining size to be used with a fireplace having an opening of a given size is based on the flue area being not less then 1/12th the area of the fireplace opening. It is desirable that the top of the chimney extend at least two (2) feet above the ridge of the roof.